When a fire breaks out in your home, it can be stressful enough without also losing your important insurance details, cash and other documents. The Fire Resistant Document Bag is perfect for keeping deeds, titles, passports, birth certificates, insurance details, cash, Securit Bank Deposit,check wallet,valuables and precious photographs - in fact anything you cherish - completely safe from the ravages and utter destruction caused by fire. Hold full sized papers, suitable for different situation, put it in your safe case or your suicase. Flexible enough to be folded into tight spaces. 1: Please keep away from little children. 2: Do not wash or immerse bag in liquid. 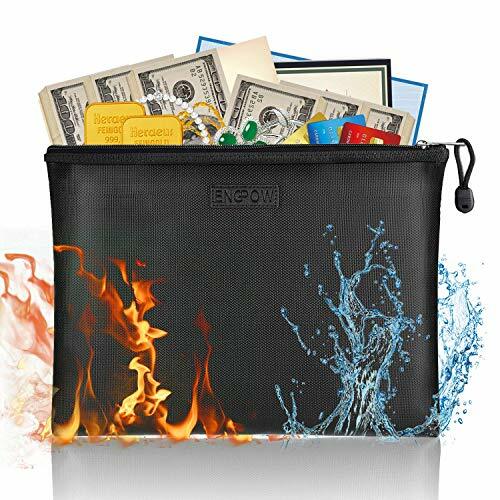 4: Dear friends, this fireproof bag is a barrier to protect your documents and cash from fire damage. But the best way to protect everything is still keep them from fire. ❤【WATER RESISTANT】- Not only does our bag stand up against fire, but it's also highly water resistant just in case it gets wet for any reason.